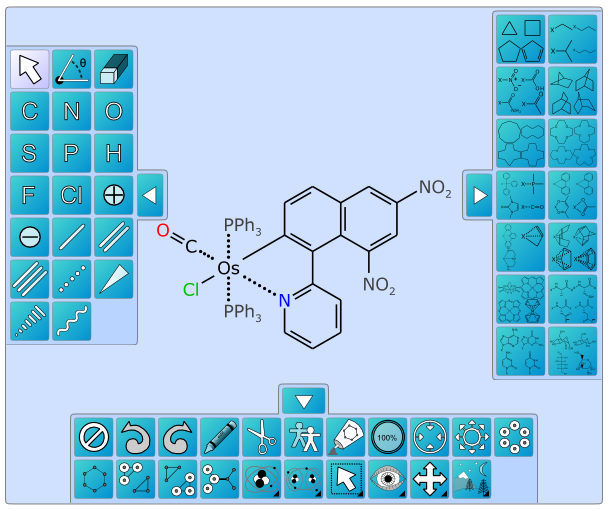 The toolbar on the left is a conventional tool palette which is recognisable to any chemist who has used a desktop software package to draw molecular structures. The bottom and right toolbars are suspiciously similar to the main menu and template groups provided by the MMDS structure editor for iOS and BlackBerry mobile platforms. By unifying the mobile and desktop sketcher paradigms into the same application, the learning curve is kept very gentle. Users who are familiar with conventional sketchers can stick to the conventional toolbar, and at any point test drive the features that were originally designed designed for use under the constraints of mobile environments. Anyone who becomes too accustomed to drawing structures on a mobile device will not have to shift gears to return to drawing structures in the usual mouse-centric way. Or perhaps most importantly, the sketching primitives that were designed for mobile devices really are more effective for certain sketching tasks, and being able to mix’n’match provides the best of both worlds.